If you follow me on Instagram you may have seen me blowing up your feed for the past few months with insta stories about my home office makeover (thank you to everyone who voted on my numerous polls). Like most home owners, we save a little money and then fix something, save a little, fix. In 7 years we’ve gone room by room trying to update our house that was stuck in the 90’s. 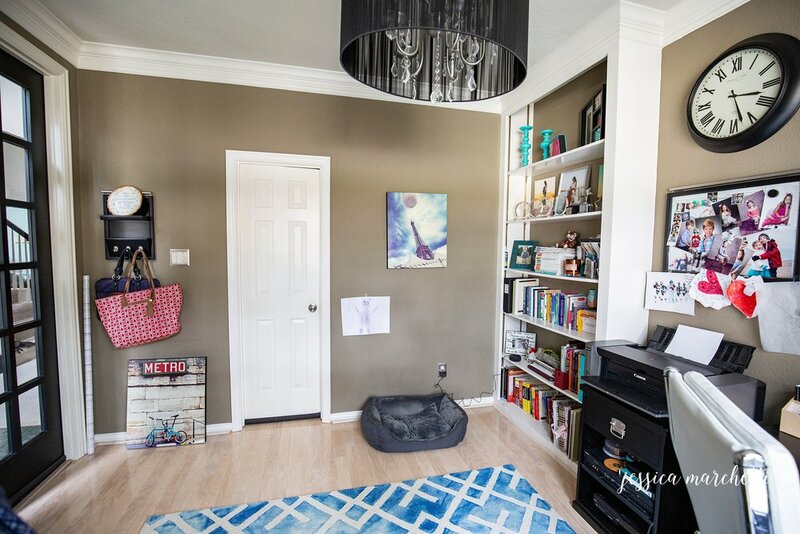 I’ve always wanted to tackle our home office, but other projects always seemed to trump this one (who can forget our THREE bathroom carpet removal makeovers). But a couple of years ago Nick went back to working at an office and I started working from home again. 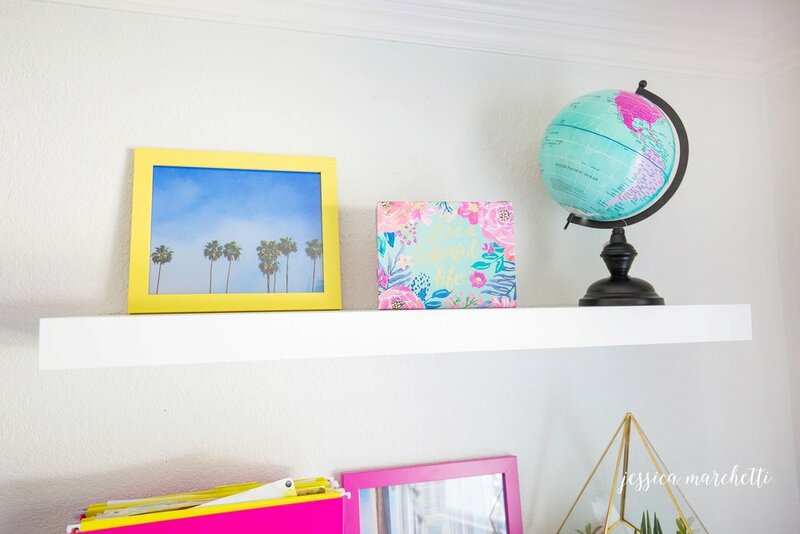 Now that I was spending all of my time in there I had enough of the drab and wanted my space to reflect the work I was doing as well as provide a serene, bright and cheerful place for me to spend my days. 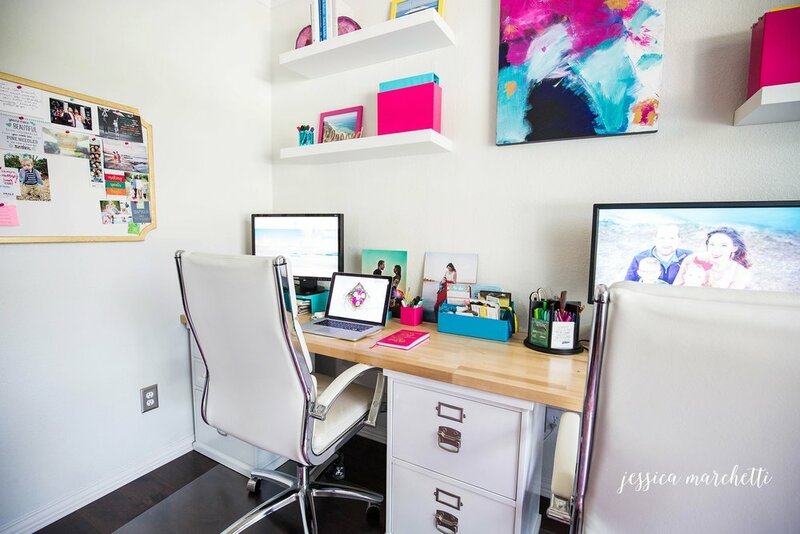 Our old office was configured very differently and we brought with us two his and hers corner desk units from Pottery Barn. Because of an oddly placed single built in shelf, we were forced to put the corner units against the opposing walls which covered up our window and didn’t allow for any additional seating. For years I complained that the whole world could look into our office and see us work, I just wanted CURTAINS. Then, because there was no where else to sit, the kids would come in and lay on the floor, which happened quite often, because we always seemed to find ourselves in there. I myself fancied the dog bed, which I used as a floor pillow almost every time I wasn’t at my desk. The two main issues I wanted tackled were moving everything away from the window (and curtains!) and a place for people to sit. The biggest challenge for me was choosing the paint color. I. LOVE. COLOR. Especially shades of blue. I’ve even lovingly nicknamed our home the house of turquoise because of the over abundance of shades of turquoise. 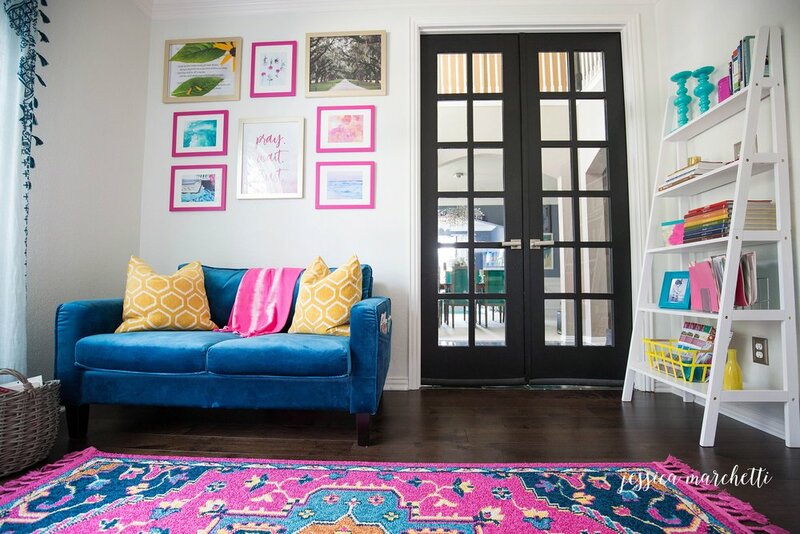 *See the family room, outdoor painting, and bathroom makeovers. * I really didn’t want any more blue. And the rooms that you see when you are looking out of this one are the bathroom (teal and white) and the dining room which is navy and white with vivid emerald green accents. What I really wanted was pink, hot fuchsia pink. Now that Nick no longer worked from home, I knew my chances of pulling this off were looking good. After much debate I decided to go with a white wall, which was the craziest idea ever for me. Even Nick kept saying, white?! white? I mean really Jess, white? Apparently I’ve brainwashed him into thinking all color everywhere is the way to be. But I knew the amount of colored accents I wanted in that room needed a blank canvas so they’d really contrast and stand out. The amount of times I had to reassure him along the way was a little much. We tested a handful of shades and he kept saying, I don’t even know what we are looking for here, I can’t believe this room is going to be white. I also had a small budget, so I knew I needed to repurpose anything I could, sell the rest and get to work discount shopping. Luckily for me this all coincided with me having surgery and lying in bed for a couple of weeks allowed me that freedom to online shop, make mock ups, and find the best deals possible (you know I didn’t buy a single thing without a coupon code or cashing in rewards points). We were able to reuse the Pottery Barn Bedford desk bases, and just spray paint them white. For the top we bought a natural birch butcher block countertop from Home Depot and put a clear coat finish on it. I knew the configuration of the room I wanted, and all of the general ideas were white foundations with vivid colors of pinks, teals and yellows/golds set against them. One of the only other repurposed items was one of the canvases I had on the wall. I love my Paris canvases but they had run their course where they were hanging and it was time for an update. I decided to paint over one of those to make a focal point on the main wall that would tie in all of the colors of the room. It’s not the best thing ever, but it gets the job done. After the wall color, the biggest debate was over the seating area. The space was actually REALLY small, and at first I was thinking we’d have two super comfy tufted chairs but after measuring I realized very quickly that probably wasn’t going to work. It would have to be two very slim chairs or a settee. My desire for no more teal also made things difficult, because believe it or not, pink and yellow aren’t exactly popular colors for seating. And given my very small sizing constraints I was left with basically 2 options, one of which was teal. Now, don’t get me wrong, it is a KILLER settee, and I LOVE teal, I just couldn’t wrap my head around any more blue in the house. But after much debate and a very one sided instagram poll the teal couch won. I’m not gonna lie, it was a great choice. It fits perfectly, it’s actually really comfortable, and it has these holders on both sides for magazines that I totally geeked out over. I immediately filled them with all of the catalogs I never have time to read, and I’m thinking if I’m seeing them every day I may actually pick them up and read them. You can find the couch online here. Another part of the room I was really excited about was my gallery wall. 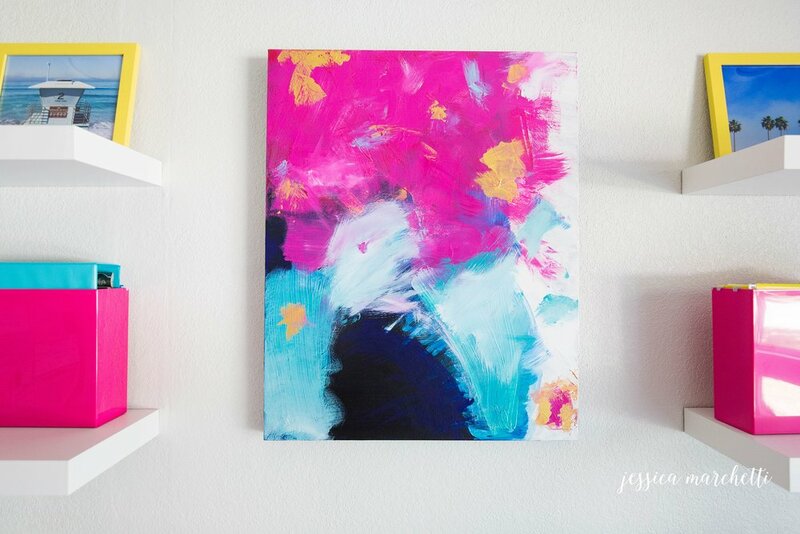 Obviously because I love hanging my art prints, but mostly because I wanted to incorporate as much biblical inspiration as possible. God has taught me SO MUCH on this business journey of mine and it’s very important to me that I continue to look to Him for wisdom and guidance then relax and trust His plans for me. I am a visual person and need those every day reminders staring me in the face. I ultimately chose to hang my favorite scripture piece from my collection, Trust in the Lord, along with The Bible’s Edge and a new graphic piece I made that I’ll add to the shop later this week that simply reads “Pray. Wait. Trust.” I mixed in some colorful watercolor art and 2 more pieces from my shop, Flat Roses and Boone Hall Plantation and Pink Ocean. I still want another scripture piece on the opposite wall, but I’m not sure yet what it will be. I’m thinking maybe above the pinboard. The other 4 prints on the wall with the desks are from my shop: Torrey Pines Lifeguard Tower, Torrey Pines Waters, Palm Tree Skies, and Scripps Pier. The rest of the room really just speaks for itself! Boho, tassels tassels everywhere and lots of pink teal and yellow. I’m so happy with how it all turned out and love spending time in here now! Even Nick likes it, which is a huge sigh of relief. Here are the side by side comparisons.